The governor announced a state of emergency for the opioid crisis in Maryland less than a year ago, but the fight against these deadly drugs has been escalating for over a decade. The battle has become more sophisticated, evolving from going after users and street level dealers to targeting pharmacies, drug wholesalers, pharmaceutical companies and pain management clinics dubbed as “pill mills”. Numerous pharmacies and pain clinics have been shuttered by federal and state law enforcement, and large companies have received hundreds of millions of dollars in fines by the federal government. The Feds have also demonstrated a willingness to go after any individual involved in the legal narcotics trade that is not playing by the rules, which includes doctors making their living by prescribing powerful and addictive opiates. Opinions differ on whether pain clinic doctors should be able to make a living, and a good one, by rubber-stamping narcotic prescriptions after minimal patient contact, but right or wrong this practice is not illegal. Federal investigators know it’s difficult to bust a doc for writing too many prescriptions, though if they look carefully some of these doctors are bound to step over the line in another way. According to the U.S. Attorney’s Office here in Maryland one group of doctors did just that, and along with two medical providers were found guilty of numerous federal crimes. 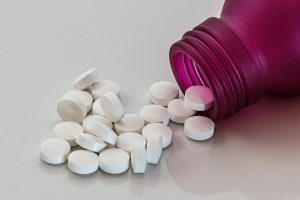 The U.S. Attorney’s Office for the District of Maryland recently announced guilty verdicts on 26 felony counts against a pain management doctor. The verdict came after a 13-day jury trial in Baltimore City where federal prosecutors successfully proved the doctor’s involvement in two separate criminal schemes. One of the schemes involved the pain management doctor and his partners sending drug testing lab work, which routinely amounted to 1,000 tests per month, to a testing facility in New Jersey in exchange for cash payments. This particular scheme generated over $4 million in revenue over about 5 years from health insurance companies and Medicare. After expenses were subtracted the lab and the doctor’s office split profits that amounted to $1.3 million apiece in illegal proceeds under the federal Anti-Kickback Act. To add insult to injury, the government also proved this particular doctor hid most of the bounty from his own partners. Other allegations proved by the government included overbilling private insurance companies and Medicare for medical procedures including therapeutic nerve blocks. The doctor would routinely enter false billing codes in order to generate more revenue for a single medical procedure. In addition to the aforementioned Anti-Kickback Act violation, the doctor was also found guilty of violating the Travel Act, commonly known as mail fraud. The use of mail fraud by federal prosecutors in overbilling cases became part of pop culture after appearing in John Grisham’s The Firm, which was made into a big screen legal drama starring Tom Cruise. Other convictions for the shamed doc include health care fraud and falsifying medical records. Health care fraud carries the highest maximum penalty of all the charges at 10 years, followed by mail fraud and the Anti-Kickback Act, which carry 5-year maximum jail sentences. Sentencing will occur at a later date, and the doctor will likely be handed a split sentence that includes some jail time followed by supervised probation. It is not out of the question that the doctor will be forced to pay a seven-figure criminal restitution amount as well. The doctor and one of his partners are still facing charges of conspiracy to defraud the IRS, though after the result in this case a plea may be on the horizon. The Blog will continue to follow this case and may post an article after sentencing. If you have been charged or are being investigated for any criminal charges including federal fraud allegations, doctor shopping or possessing a fraudulent prescription contact Benjamin Herbst at 410-207-2598 for a free consultation. Pain Management Physician Convicted On Charges Of Accepting Kickbacks And Submitting Fraudulent Bills For Anesthesia Services, www.justice.gov.